DOYLESTOWN (PA) – It will be the “Battle of the Unbeatens” for the top spot in the Middle Atlantic Conference (MAC) when 5-0 and ninth-ranked Delaware Valley University travels to 5-0 Albright College on Saturday, October 7. Kickoff at Shirk Stadium is set for 1 p.m. Both squads are 4-0 in conference play and atop the standings, one-game ahead of defending champion Stevenson University (which DelVal defeated two weeks ago) and Widener University (which Albright defeated two weeks ago). For the Aggies, there is also the added incentive of avenging last year’s 20-17 home loss to Albright when the Lions scored with just 6.3 seconds left. It was DelVal’s first regular-season loss to Albright since 2002. The Aggies’ opened the 2017 campaign with a 24-19 home triumph over No. 11 Wesley College. They have then defeated their first four MAC opponents by a combined score of 155-31. The last was a 60-7 rout at FDU-Florham last Friday night. 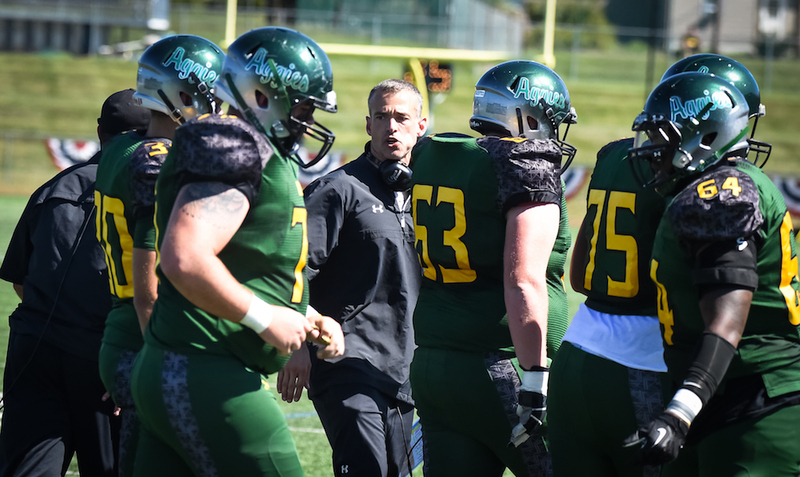 Offensively, DelVal is averaging 35.8 points and 375.4 yards per contest. It is a balanced attack with 201.8 yards per game on the ground and 173.6 yards per game through the air. They have committed just six turnovers through the first five contests. Junior quarterback Dashawn Darden (Norristown, PA/Cardinal O’Hara) has completed 74 of 123 passes for 837 yards, 12 touchdowns and just two interceptions. He tossed four touchdown passes in just three quarters of action at FDU-Florham. Darden is also a threat to run as he has 246 yards and two scores on 51 carries this year. Two-time all-MAC first-team tailback Devauntay Ellis (Ewing, NJ/Ewing) has lugged the ball 87 times and has netted 497 yards (5.7 avg) and four trips to the end zone. Junior wideout Marquis Ellis (Owings Mills, MD/Franklin) caught a touchdown pass at FDU-Florham to give him a score in four of the first five games. He leads a balanced unit with 17 receptions. Sophomore tight end Dan Allen (Philadelphia, PA/Penn Wood) has become a threat in the passing game, He has caught 12 passes for 211 yards and two scores, including a 73-yard reception last week. Defensively, DelVal is ranked seventh in Division III with an average of 10.0 points allowed per game. The group is also 13th in total defense with an average of 234.6 yards (77.8 rushing, 156.8 passing) per showing. They have notched 12 sacks while forcing 11 turnovers over the first five games. Senior linebacker Nicholas DiGati (Townsend, DE/Middletown) leads the team in tackles with 42 with 21 coming at Wilkes (second in school history for a single game). He has also forced one fumble on the year. Senior safety and preseason All-American Shawn Miller (Laurel, DE/Laurel) has 26 tackles and one interception to his credit. The Aggies are also getting great production from seniors linebackers Michael Ockimey and Nick Wright (Hatfield, PA/North Penn), along with junior end Christian Snowden (Williamstown, NJ/St. Joseph Hammonton). Ockimey has 23 tackles, three sacks, two forced fumbles and two fumble recoveries. Wright’s totals include 24 tackles, three sacks, two interceptions, one forced fumble and one fumble recovery (which he returned 70 yards for a score against Wesley). Snowden is tied for lead in Division III with three fumble recoveries. He also has 19 tackles and 2.5 sacks. The Lions, who are receiving votes in both national polls, opened the season with a 38-35 overtime victory over non-conference Salisbury University. They followed with a 50-17 rout of MAC foe Misericordia University before pulling out their next three wins by a total of nine points (21-17 at Lycoming College, 9-7 versus Widener University, 34-31 at King’s College). The triumph at King’s saw Albright rally from a pair of 17-points deficits. The Lions were still down 10 going into the fourth quarter when a touchdown was followed by a pair of field goals, the last coming with 58 seconds left, for the three-point win. Albright averages 30.4 points and 377.8 yards (94.6 rushing, 283.2 passing) per game on the offensive side of the ball. They have a veteran signal-caller leading the unit in senior Alec Vignola. Vignola has completed 112 of 189 passes for 1,360 yards, eight touchdowns and five interceptions. He has also rushed for two scores. Vignola’s favorite targets are senior Malik Jackson and sophomore Michael Jordan. Jackson has hauled in 27 passes for 418 yards and three touchdowns. Last year, it was Jackson that the caught the game-winning, 14-yard touchdown pass from Vignola in the closing seconds. Jordan has caught 25 tosses for 348 yards this season and has reached the end zone six times. Sophomore Nigel Sealey leads the ground attack with 188 yards and two touchdowns on 37 carries. Senior Chris Dawson has 115 yard and four scores on 31 touches. Defensively, the Lions are allowing 21.4 points and 329.6 yards (122.6 rushing, 207.0 passing) per contest. The unit has racked up 16 sacks. Two players to watch are seniors Grant Boehler and Isaiah Baylor. Boehler, a linebacker, has team-highs of 42 tackles and three interceptions. Baylor, the reigning MAC Defensive Player of the Week, leads the squad with 4.5 sacks and two forced fumbles while also notching 26 tackles.